For you conspiracy theorists who think Gail Collins must secretly be on the Obama 2012 payroll, this story may prove you right. 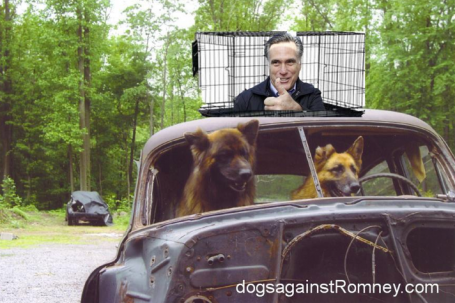 It's not just that the New York Times biting columnist has almost single-handedly kept the story alive of Romney dog Seamus traveling to a family vacation in a carrier strapped to the roof of the station wagon. Poor guy survived half a day up there with little more than the runs, according to reports, including the Boston Globe which first "broke" this story in 2007, before the former Governor of Massachusetts was defeated by John McCain for the 2008 GOP Presidential nomination. Ms. Collins' Seamus-gate companions include: Dogs Against Romney, a "Super Pack" that is raising money and awareness about the evils (it's illegal in many states) of transporting your family pet atop the carro. There's also the Irish Setter's Twitter handle @SeamusRomney. It's Tale of two Tails: the noble pooch who is caged by his master for 12 hours and hosed down after he gets diarrhea versus the cute Portuguese Water Dog whose owner allows him to run free on the White House lawn. It's clear that this campaign "plant" targets Latino voters who the President has been aggressively courting since he broke his promise on reforming the immigration system, while increasing deportations, turning off many Hispanic voters already anxious about the economy. Yeah, the same voters Time Magazine trumpeted on its Yo Decido cover may determine Election 2012 due to the rápido growth of the U.S. born segment of this population of voting age by November. It doesn't take a TV producer searching for a "kicker" during sweeps or a Fleishman-Hillard PR queen to know how easily cute animals manipulate people's feelings. But Viviana, tweets a follower, I loathe dogs because they're needy & smell. I like gatos. Does that mean I'm a bad leader?